What Flow rate (gallons per minute or GPM) needs do you have? In the chart below, each row represents the capacity of one tankless water heater unit. Cooler climates will restrict the flow rate because the temperature rise is steeper. Most tankless units are rated at the capacity for warmer climates. Units with GPM lower than 3 should be considered point-of-use tankless water heaters. Looking for the Best Electric, Natural Gas or Propane Tankless Water Heaters? You've come to the right place! Research and choose the best system for your home or business right here! If you're looking for the best electric tankless water heater on the market, the Stiebel Eltron Tempra 24 might be exactly what you need. Not only is it a high-tech, energy-efficient system, but it's also one of the most highly-rated by homeowners across the country. If you're looking for a water heater that you can control to the degree, this is the unit for you. The ECO 27 comes with a variety of functions and features that give you complete mastery of your hot water output. 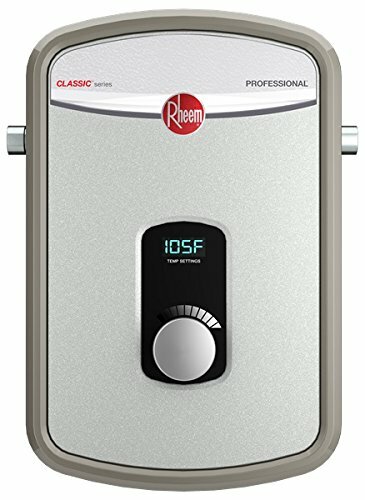 If you are looking to save some money and only need a point-of-use tankless water heater, the Rheem RTE 13 may be what you need. It's affordable and a top-model brand. 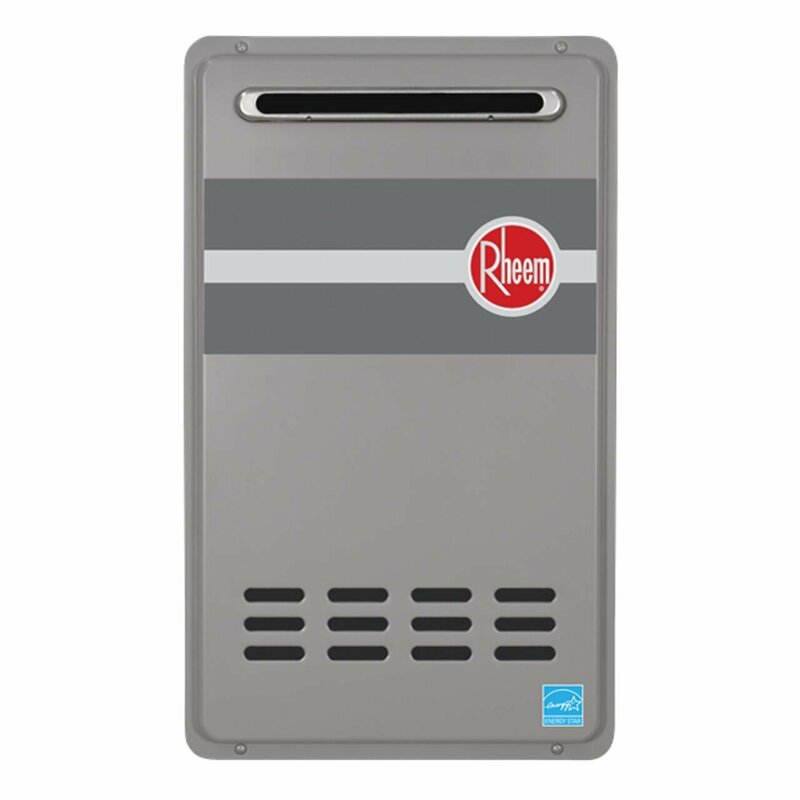 If you're looking for the best natural gas whole house tankless water heater on the market that you can install outdoors with no need to vent, the Rinnai V65eN might be exactly what you need. Not only is it energy-efficient, but it's also one of the most highly-rated by homeowners across the country. If you're looking for a water heater that is easy to use, this is the unit for you. The Takagi T-KJR2 is the most popular unit in its GPM category. Owners love it for it's small size and price for a whole house system, but keep in mind that it is for a small house situation. If you are looking to save some money and only need a natural gas point-of-use tankless water heater, the Marey 10L Natural Gas system may be what you need. It's affordable and the Marey company has 60-year track record of excellence. 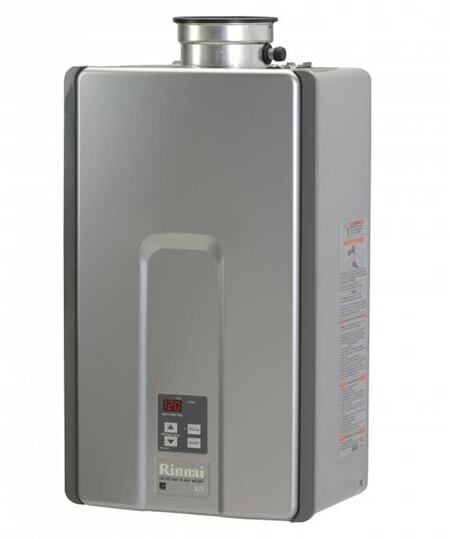 If you're looking for the best whole house propane tankless water heater on the market, the Rinnai RL94iP will be hard to beat. 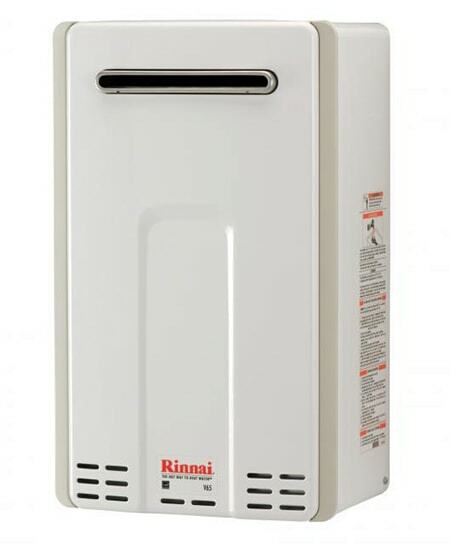 Whether you live in a warm or cold climate this Rinnai will be able to handle 3+ showers simultaneously and efficiently. If you are looking to save some money and only need a propane point-of-use tankless water heater, the Marey 10L (LP) system may be what you need. It's affordable and the Marey company has 60-year track record of excellence. How Tankless Water Heaters Works? To understand it, you first have to understand how traditional water heaters work. The conventional tank water heater system has a large tank where hot water is stored. It’s zoomed to your faucets whenever you need it, but it’s also very wasteful because the unit is constantly expending energy to keep the water temperature hot even when you don't need it. Tankless water heaters take up a much smaller footprint and are much more efficient. Instead of storing and reheated gallons and gallons of hot water in a storage tank all day, they simply heat up water once a hot water faucet is turned on somewhere in the house. The first tankless water heaters were what are known as "point-of-use" systems. These are small heating units that are attached to a wall or the inside of a cabinet near the sink, shower, washing machine, etc. that needs hot water (see the diagram to the right). However, in recent years a single tankless water heater has been engineered to provide hot water for a "whole house". Whole house systems, when they first appeared on the market, were extremely expensive as compared to the best tank water heaters. However, because the technology has vastly improved, whole house tankless water heaters are now more affordable than ever. Tankless water heaters can be powered by natural gas, liquid propane and electricity, but they all operate under the assumption that energy should only be expended when it’s actually needed to heat your H2O. Why Should You Switch ? All right, you may be saying. I understand what they do. But why should I bother? If you use a small or moderate amount of hot water every day (less than 41 gallons), you can reduce your energy consumption by 24 to 34 percent. If you use a large amount of hot water on a daily basis (86 gallons or more), you’ll save somewhere in the range of eight to 14 percent. Remember, you only heat the water when a hot water tap is turned on. This means you aren’t wasting energy through a big tank of water continuously reheating unneeded hot water. If you install the right unit for your home that can handle the Gallons Per Minute (GPM) needs that you have, no one in your home should experience running out of hot water while showering, not matter how long the shower lasts. Isn't that a novel idea? In addition to reducing your energy bill and providing unending hot water, you’ll also be doing your part to help the environment. Tankless water heaters are much more eco-friendly than traditional water heaters since they’re only used on an “as-needed” basis and have a longer lifespan, almost double in most cases, than tank heaters. Because they last longer and are much smaller, there won't be so many littering our landfills like the bulky, used tank units do. Whether you choose to place point-of-use units throughout your home or one whole house unit where your current tank unit resides, you will gain floor space in your home where one a large tank was utilizing that space. All in all, tankless water heaters are an excellent investment for the future and your home's improvement. Every family needs hot water, and tankless water heaters can provide that hot water with much more efficient, longer-lasting technology. Allright, have we finally convinced you! Before you swipe your credit card, however, you should make sure you’re buying the right type of tankless water heater for your needs. The best electric, point-of-use tankless water heaters are as small as a book. Others, including gas and propane systems, might require more room for burners, valves, vents and things of that nature. If it’s important to you that your tankless water system is point-of-use and can fit under your sink, be sure to take some measurements before you go shopping. If you desire a whole house system, you can typically place it on the wall where your existing tank water heater is currently. Prices vary so drastically due to the Flow Rate (Gallons Per Minute - GPM capacity) and additional bells and whistles. The larger the flow rate the more expensive the unit will be. Generally speaking, the more basic and smaller systems start at $400 while the bells-and-whistles and high flow rate types can range anywhere from $900 to $2,000. You’ll also need to factor in things like delivery, installation and maintenance costs, so don’t forget these numbers when you’re working up a budget, either. How many gallons do you need your system to pump per minute? What’s your desired temperature rise and flow rate? You might also want to look up the unit’s cost of fuel per BTU (British Thermal Unit). All of these figures will help you determine your home’s hot water needs and the necessary power requirements for your tankless heating system. Like anything else, tankless water heaters have their drawbacks. You’ll need to be well-informed about their pros and cons in order to make a smart purchase decision. Advantage: Tankless heaters can save you more than $100 a year on your energy bill. Disadvantage: They can cost more as an initial investment. On the plus side, they’ll recoup their price in just a few short years, and they also have a longer life expectancy. Conventional heating tanks typically last 5-10 years, but tankless water heaters will keep on chugging for 20 years or more. Advantage: They heat water directly at the tap, eliminating the need to wait around for your hot water tank to re-fill. Disadvantage: A single tankless heater might not be enough to provide hot water for your entire home, especially if your family requires what’s known as “simultaneous usage.” For example, if you want to run the washing machine at the same time as the upstairs shower, you might need to install separate heating units at both sinks to get simultaneous hot water in both rooms. Advantage: Electric heating units are eco-friendly thanks to their “as-needed” energy usage. Disadvantage: Gas-powered heating units can sometimes offset energy savings through their use of gas burners. If your primary reason for buying a tankless water heater is to live a greener life, you might want to purchase an electric heating unit instead. In a tankless, gas-powered water heater, cold water is drawn into the unit and warmed through a series of burners and heat exchangers. Because they can handle high volumes of water, they’re great for large homes or those with high water demands, and they’re also the most popular model for families who live in very cold climates. However, they’re more expensive in both short- and long-term costs than other tankless models. Propane water heaters work very similarly to gas water heaters. In fact, among some manufacturers, they’re marketed and sold the same way. The difference is mostly in the way that propane and methane (natural gas) burn, which can in turn affect things like cost, energy efficiency and the longevity of the unit. Electric units are the most affordable option in tankless water heaters simply because the majority are the smaller, point-of-use variety. As such, they tend to cost less upfront and don’t require as much maintenance as other models. Therefore, they’re best for small homes or those with low or intermittent hot water needs. The bottom line for you will be the GPM flow rate that you need and want for your home. It’s time to get down to specifics. If you’re ready to make a purchase and are looking for some brands, models and specs to get you started, here are just a few tankless water heater reviews. If you’re looking for a water heater that you can control to the degree, this is the unit for you. 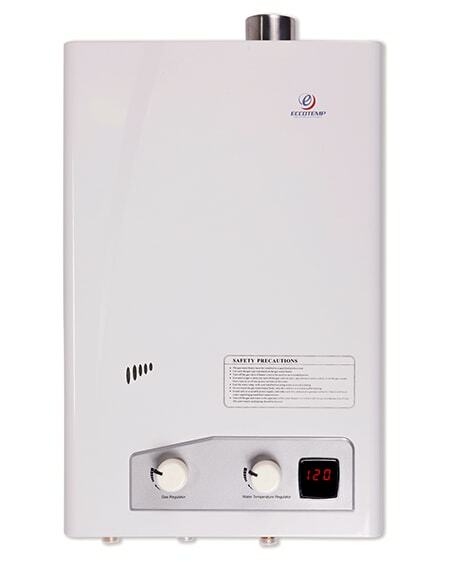 The ECO 27 comes with a variety of functions and features that give you complete mastery of your hot water output. The biggest advantage of the ECO 27 is its size. As a compact electric unit, it can be hidden in cupboards for interior design purposes or mounted on walls to free up floor space. Just don’t think that its small size decreases it efficiency! The ECO 27 can heat almost three gallons of water per minute, and it’s also entirely self-modulating when it comes to energy efficiency. It uses its own sensors to figure out how much energy is needed to heat up your water, offering you a hands-free experience that’s both convenient and refreshingly free of jargon. You don’t need to be a heating specialist to use this technology. If you do like to fiddle with settings, however, you should know that the ECO 27 can be adjusted to your ideal temperature down to the degree. Very few electric water heaters offer this level of precision and control. You can thank the unit’s three separate 9KW heaters for its versatility. One flaw of the ECO27 is that it isn’t really suited to large homes or offices unless multiple units are installed on the property. Like all electric water heating systems, it struggles during high-demand simultaneous usage, so you may have to choose between showering and running the dishwasher. It’s a small sacrifice for all the perks, but it’s still a sacrifice. All things considered, the ECO 27 is one of the most versatile and energy-efficient tankless water heaters for its size. It may lack the power of larger units, but for a compact system that can be mounted anywhere in your home, its convenience more than makes up for its deficits. Check out the ECO 27 on Amazon to learn more about this great product and what it can do for you! If you’re looking for the best electric tankless water heater on the market, the Stiebel Eltron Tempra 24 might be exactly what you need. Not only is it a high-tech, energy-efficient system, but it’s also one of the most highly-rated by homeowners across the country. 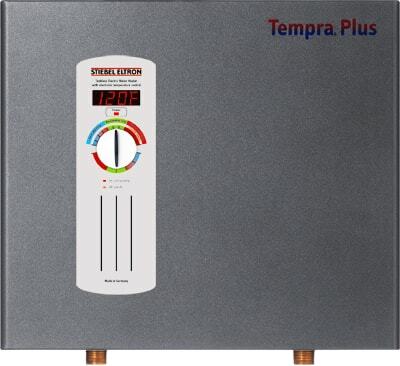 The Tempra 24 is an electric system, so you won’t need to mess with burners and heat exchangers. All the work is done for you inside the unit. It’s very safe and very reliable, especially if you have inquisitive children who like to roam around and get into trouble. It also comes with a digital interface that will always give you the exact data you need in a brightly-lit, easy-to-read format. Now, electric water heaters usually come with a glaring flaw in the sense that they don’t offer enough power to heat water throughout your entire house. I’m here to tell you that the Tempra 24 is the exception. Like the name (“Whole House”) implies, this water heater can handle everything from washing machines to jacuzzi tubs with ease. The secret is in its patented Advanced Flow Control technology, something that keeps your water temperature steady and entirely under your control no matter how many sinks or showers are demanding hot water. Never again suffer a fluctuating flow when you’re trying to get things done! Make sure to check your electrical panel before buying the Tempra 24 because it needs to support two 60-amp circuits for installation. Unfortunately, if your electrical panel isn’t up to date, the Tempra 24 can’t be fit into your home. It doesn’t get any better than the Tempra 24. Its only major drawback is that it requires up-to-date wiring in your electrical panel, but even if you don’t have it, you can always retrofit the correct circuits and install the Tempra 24 afterwards. Read about the product on Amazon to check it out and other tankless water heater reviews to help you make your purchase decision. 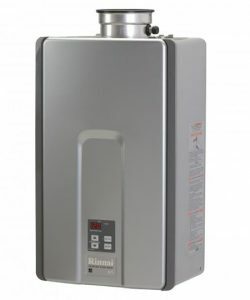 One of the most popular tankless water heaters on the market, the Rinnai RL75iN is what you buy if you only want to buy one water heater in your lifetime. A high-energy, high-tech unit, it comes with everything from combustion fans to digital controllers to ensure that your hot water is delivered exactly how you want it. It’s also gas-powered, meaning that it can accommodate a large building or bustling household with ease. This isn’t a brand where you need to install multiple units around the house to get hot water at every faucet. One Rinnai RL75iN is all that’s required to provide hot water for sinks, showers, dishwashers, washing machines and everything in between. One drawback of this unit is that it needs a moment to lumber to life; users have reported that it can take anywhere from 15-30 seconds before they get hot water for their morning showers. Once it’s on, however, the same users report unlimited hot water with no interruptions, so it’s up to you to decide if a short flow delay is an acceptable sacrifice for long, hot and luxurious showers. If you admire the model but hate the methane, the Rinnai RL75iN can be converted to a propane unit, though this isn’t recommended as a DIY project. 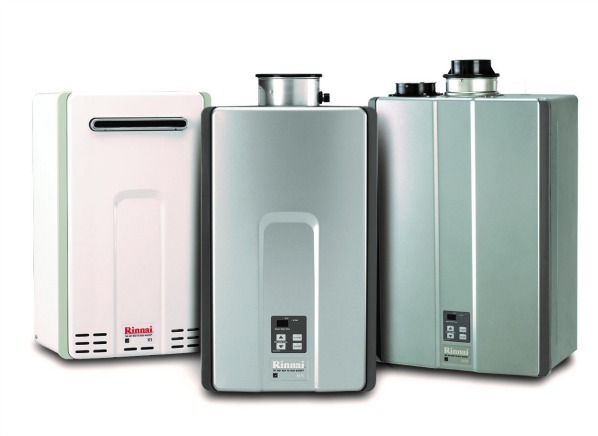 Talk to a Rinnai technician if you want to make the switch. With the Rinnai RL75iN, you get what you pay for, and what you pay for is quality. 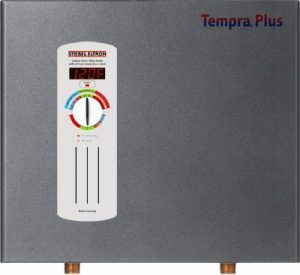 If you’re looking for a workhorse unit that will provide fast, piping hot water for decades to come, this is easily the best tankless water heater on the market. Check out its page on Amazon and see its amazing reviews for yourself! Perfect for campers, truckers, travellers and construction workers, the Eccotemp L5 is a godsend when it comes to portable hot water. Even if you aren’t sleeping under a traditional roof or washing your hands at a regular sink, the Eccotemp L5 will allow you to experience the luxury of hot water no matter where you are. When I say hot, by the way, I mean hot. This isn’t a half-hearted unit that spurts out tiny streams of lukewarm water. Thanks to its high-powered propane burners, the water heated by the Eccotemp L5 can actually be uncomfortably hot unless you manually adjust the temperature and pressure controls. The good news is that the unit comes with mounting equipment and tank accessories already in the box, so you can set up your shower with the buttons just a few inches away if you’d like. It also offers a built-in timer that will shut off the burner after 17 minutes for safety purposes. Another great benefit of the Eccotemp L5 is its versatility. While quite popular among campers and off-roaders, it also has plenty of uses around the house; many customers, for example, have found it to be a welcome addition to hot tubs and outdoor saunas. If you only need hot water for something special every once in awhile, a portable unit can be much more convenient than hooking up your new device to a complicated stationary system. A common complaint of the Eccotempt L5 is that the flame of the burner is easily snuffed out, so if you’re using the unit outdoors, make sure you protect it from the wind. Though not without flaws, the Eccotemp L5 is a worthy purchase if you’re looking for an alternative to traditional water heating systems. It can be used outdoors, around the house and even as a back-up water heater in case of blackouts or other disasters. Read more about the Eccotemp L5 on Amazon to figure out if it’s the right tankless water heater for you! If you don’t have a lot of money to spend on a tankless water heater, you may be wondering if it’s even an option for you. The answer is “yes,” and with something like the Rheem RTEX 13. For one, the RTEX 13 carefully modulates its power to ensure that you’re always getting a steady flow rate and an unchanging water temperature. I’ve seen many units in my time that suffer from sudden temperature fluctuations if the water heater gets overtaxed, but this doesn’t happen here. Whether you’re showering, running a load of laundry or even just washing dishes, you can count on the RTEX 13 to keep your water temperature consistent. Another great thing about the RTEX 13 is that it’s one of the smallest and most convenient electric systems on the market. Many customers are so awed by its tiny box that they wonder if it’ll even work, but it does! It offers amazing power for its size, and what’s more, it does it all from a unit that can be installed just about anywhere. Say goodbye to huge water tanks or overly elaborate technological systems. The RTEX 13 is so small and light that it might just fade into the wallpaper entirely. You will need copper tubing for this water heater, so if you currently have plastic, it’s time to make a change. The cost of new tubing can sometimes offset the savings you get from the low price of the model, so the RTEX 13 might not be for everyone. Check your plumbing and electrical panels and use your best judgment. Small but powerful, the RTEX 13 is an excellent choice for the budget-minded. It might not heat every sink running in your house at once, but if you’re smart in using it, it can be a great way to save money on your electric bill without breaking the bank to get it installed in the first place. Order it today from Amazon and see for yourself! 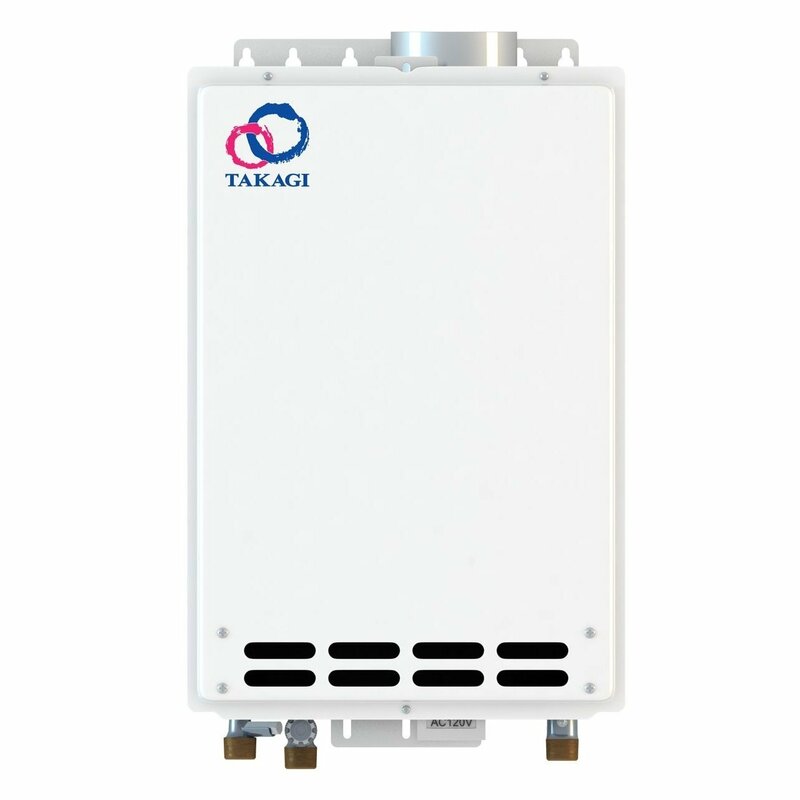 Despite being tankless, the Takagi T-KJr2-IN-NG has a lot of similarities to a traditional water heating system, so it’s excellent for buyers who are uneasy or unsure about making the switch. It does require some know-how in terms of how heating systems work and how they need to be maintained, but if you’re willing to do your homework, it’s a system that will operate beautifully and for decades at a time. The first thing you should know about the Takagi T-KJr2-IN-NG is that it usesnatural gas. This means it needs to be compatible with your existing gas lines and ventilation systems just like a conventional heating unit. Once the business of installation is done, you can sit back and enjoy hot water delivered to every inch of your home from a single box. The Takagi T-KJr2-IN-NG doesn’t play around; you can even fill a bathtub with it! It’s an amazing unit that operates on a “seen and not heard” level where a fully-functional system is one that you don’t even have to think about. It’ll operate just as silently and efficiently as a water tank. You’ll also enjoy very simple and straightforward controls with the Takagi T-KJr2-IN-NG. A wall-mounted controller will display options for flow rate, “in” temperature and “out” temperature, so you can customize everything according to your preferences or budget. If you’re concerned about your bill, adjust the settings down; if you want extremely hot water for your next load of laundry, adjust the settings up. Be warned that the Takagi T-KJr2-IN-NG isn’t a system to cut your teeth on, not unless you’ve done extensive research beforehand. With all the power of a traditional water heater, the Takagi T-KJr2-IN-NG is a great choice if you’re worried about making the switch. It’ll operate out of sight and just as well as your old unit. Just make sure that you aren’t taking any chances with the natural gas component; have it professionally inspected and installed if you aren’t confident in your DIY skills. Another solid model from Eccotemp, the FVI-12-LP was specifically designed with smaller homes in mind, so look here first if you reside in a small house or don’t have extreme hot water demands. While it can and does provide hot water to large buildings, it’s best suited for individual and residential use. The first thing you’ll notice about the FVI-12-LP is its price. It’s very affordable, especially when you consider that it’ll keep saving you money as it lowers your energy bills down the line. You can expect to save between 10 and 30 percent on your annual energy costs overall. In terms of operation, it uses propane but has a electronic ignition system, so you’ll enjoy the best of both worlds. This dual system also extends to its wall-mounted controls; you’ll have separate knobs for gas and water, and you can control temperature, flow and pressure with a flick of the wrist. The FVI-12-LP delivers three gallons of water per minute, a rate that’s slightly low for a propane water heater but right on par with the average usage of a small home. It can also be used in cabins, cottages and vacation homes, so it’s a great alternative to water tanks if you only require it a few times a year. Note that you’ll need to install a special outdoor vent to pump out harmful fumes. 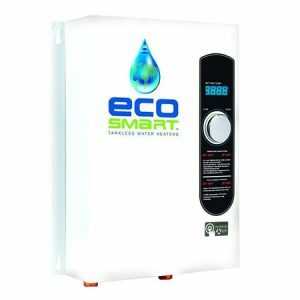 If you’re looking for the best tankless water heater for small homes, the Eccotemp FVI-12-LP is exactly what you need. While it can’t quite measure up to those designed for high-volume hot water requirements, it’s a great little system for non-strenuous demands. As you can see, there’s a lot to consider when shopping for a tankless water heater. But don’t get discouraged by all the criteria! It’s easier than you think to make a change, especially if you do your homework and plan things out in advance. Take your time, make your measurements and browse all of your options. Then go out there and buy a tankless water heater that will completely revolutionize the way you use hot water in your home! P.S. All images are courtesy of the respective manufacturers' (Stiebel Eltron, Eccotemp, EcoSmart, Takagi, Rheem, Rinnai) and other free image services (Pixabay).